I love the story of how I met Casey! A little while after I posted about my design of Small and Chic Home, I woke up one day and Lucketts Store was following me on Twitter. My mom and I used to go antiquing there all the time when I was younger, so I thought it was the funniest coincidence! It turns out Casey was the girl behind it, and we started emailing back and forth. When I checked out her blog, I recognized her from her wedding feature on Snippet and Ink. Small world, huh? When she asked me to design her blog, I just knew we were going to have fun! Casey said she liked browns and greens, and listed blogs like Miss Mustard Seed and Ritzy Bee Blog as sources of inspiration. This was what I put together for her initially. After the initial inspiration board, I wound up tweaking the colors and the script font, and came up with a design that we were both really happy with! I think my favorite thing is the color scheme. I love that mint and the blue-greens paired with the burlap texture! And how perfect is it that the greens in the robe in her about picture coordinate with the rest of the design? 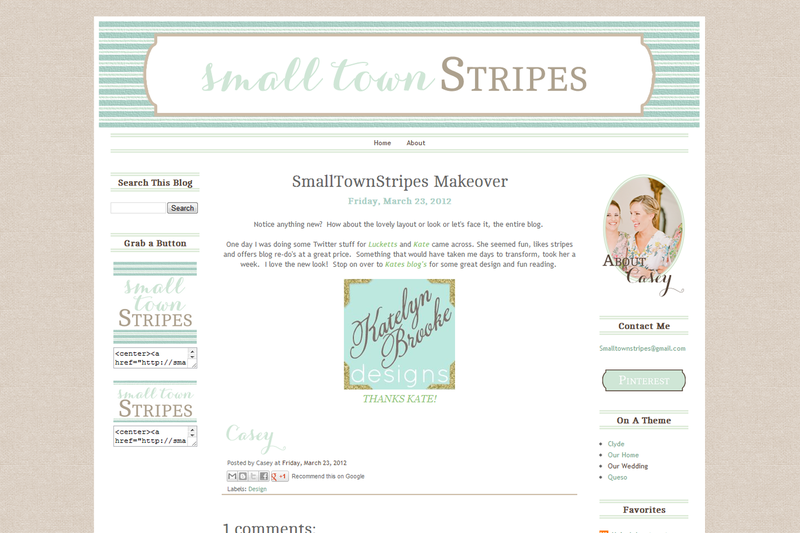 Make sure you check out Small Town Stripes for yourself! This looks fantastic, Kate! I love the header and the color combinations. If sapphire wasn’t an obvious color choice for my blog, I would want this design! Lovely! Kate, the textures in the stripes of the header and burlap are amazing! LOVE it! I absolutely just love seeing how you transform everyone’s blogs. These are my favorite posts! Thanks Annelise! Hopefully I’ll be able to keep doing them at least once a week! another beautiful design Kate! Bravo – you never cease to bring beauty to the web! !